You can’t really call yourself a makeup lover until you’ve mastered the smokey eye look. 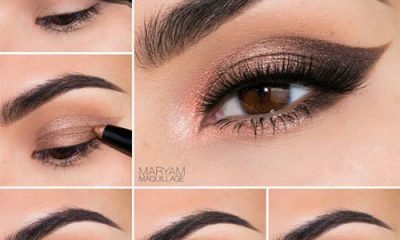 The smokey eye is a classic eye makeup look. 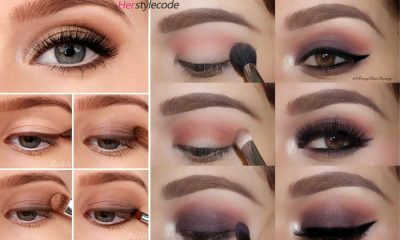 It complements any eye color and shape and creates a dark and dramatic look that is gorgeous for a night out or any semi-formal event. However, smokey eye looks can also be frustrating and intimidating. Even women who have been wearing makeup for decades often find themselves balking at the sight of jet black eyeshadow. Let’s face it. Dark eyeshadow shades are extremely unforgiving. One wrong move, and you end up looking gothic or like your three-year-old applied your makeup. However, you shouldn’t let that reality scare you away from smokey eyes. 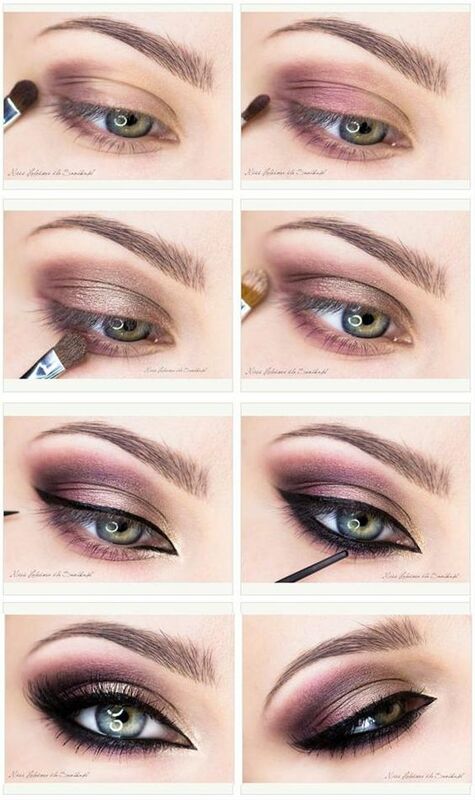 When applied correctly, a smokey eye is one of the most gorgeous eye makeup looks you can create. Plus, it’s actually pretty simple when it comes down to it. 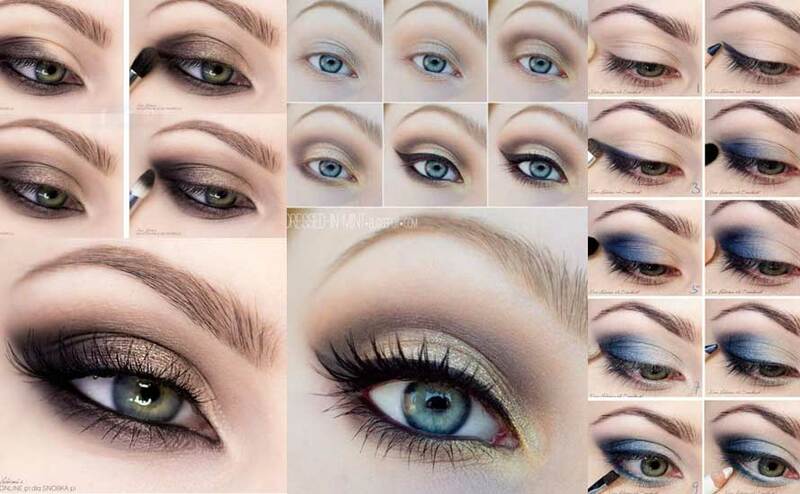 Smokey eye looks generally only include a few shades of eyeshadow. As long as you put the right shades in the right place and blend sufficiently, you’re good to go. All it takes is a little bit of knowledge and a little bit of practice to become a smokey eye master in no time. 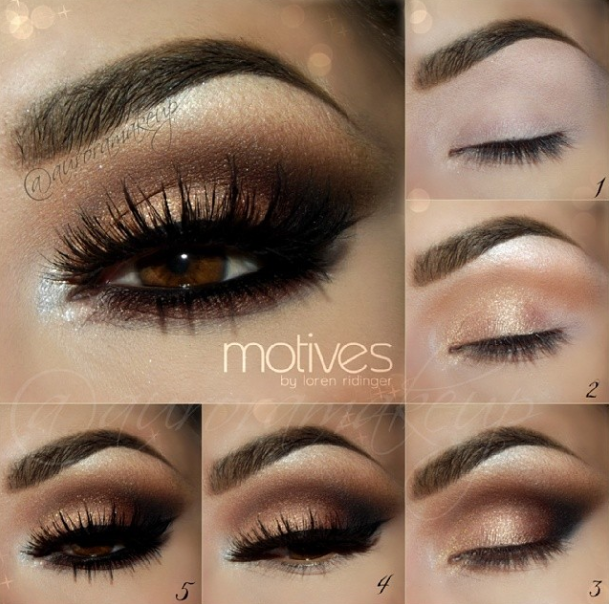 This smokey eye look includes a gorgeous blend of neutrals in warm tones. It is more subtle and less jarring than most smokey eye looks due to the neutral range of shades that are used. This look keeps a pale shade at the center of your eyelid to brighten up your eyes. However, it includes a darker neutral within the crease in order to dramatize the look. There’s nothing more gorgeous than a shimmery smokey eye. While classic smokey eye looks primarily include eyeshadows with a matte finish, this look puts a shimmery twist on the traditional style. It uses a blend of dark black and shimmery gold shades to create a breathtaking smokey finish that is fit for any party. The best smokey eyes include dark eyeliner to amp up the drama of the look. The look above involves thick shading along the bottom lash line. Also, it includes tight lined eyeliner along the inner rims of the upper and lower lash lines. 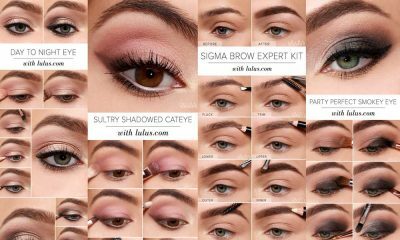 This technique helps brighten your eyes and make them stand out amidst the dark shades of eyeshadow. 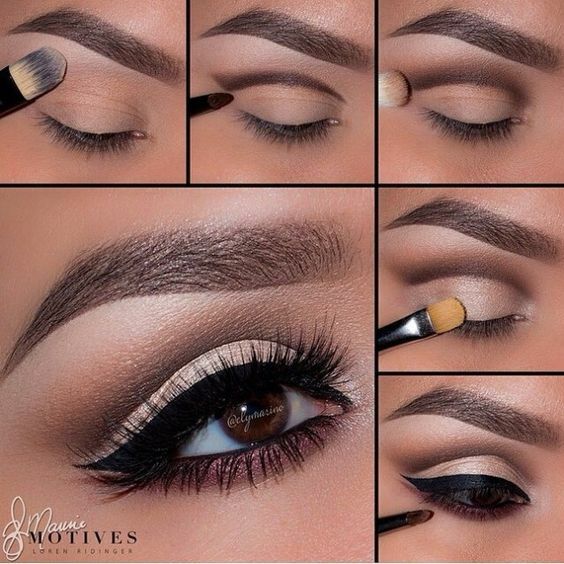 Smokey eye looks don’t have to include gray and black shades of eyeshadow only. While dark shades are what really make a smokey eye look, you can add in some more colorful shades as well. The look above includes an accent of muted pinky eyeshadow to brighten it up. 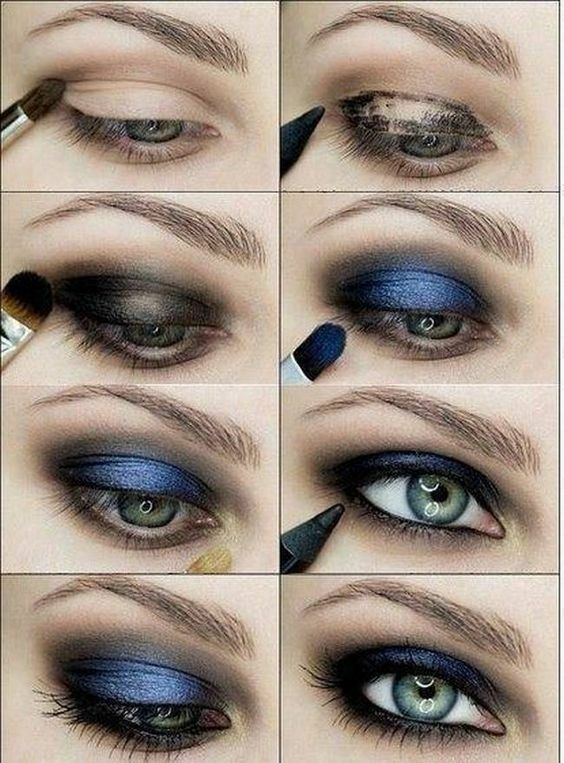 Navy blue is a common color included within smokey eye looks. To achieve the look above, apply a dark black eyeshadow to your entire lid before applying the blue shade. This technique helps keep the entire look dark and dramatic and mutes the blue while still allowing it to add to the beauty of the look. Who says a smokey eye can’t be pink and gold? While classic smokey eye looks are generally cool-toned and use shades of gray, silver, and black, rules are meant to be broken. 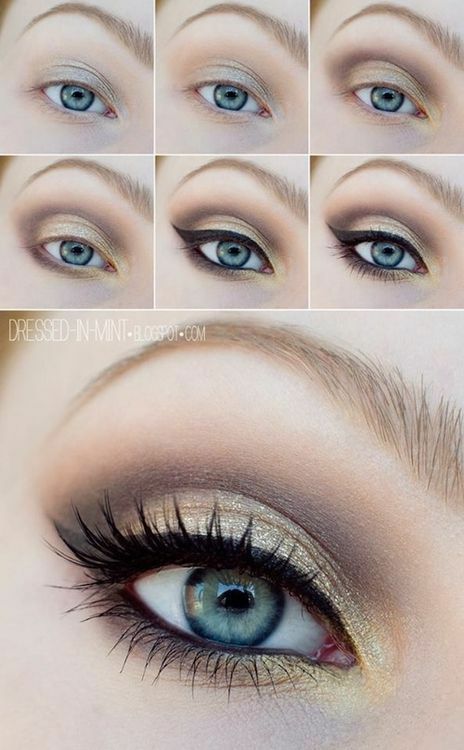 This warm-toned smokey eye look helps brighten up your eyes and is perfect for formal events during the summer months. You can’t go wrong with a navy blue smokey eye look. This smokey eye is extremely simple and isn’t too dramatic. However, the dark shades used amp up the drama of the look and make it the perfect choice for any special occasion. This classic smokey eye look is simple to achieve but stunning at the same time. It includes a traditional blend of silver shades with a neutral accent to add a bit of extra interest to the look. 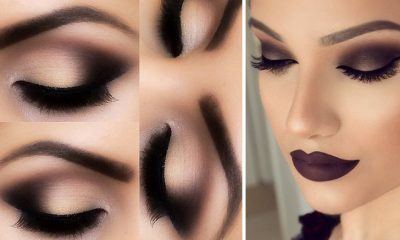 If you’re aiming to create a simple smokey eye in minutes without putting in too much effort, this is the look for you. This is another smokey eye look that includes traditional shades of gray. However, this look leaves the center of the eyelid pale with a light, shimmery shade. This helps brighten up your eyes while the dark colors on either side of the eyelid maintain the dramatic finish of the look. What could be more trendy than an eye makeup look that combines a smokey eye and a cut crease. This gorgeous look does just that using a blend of dark, warm neutrals and thick winged eyeliner. It’s dramatic, trendy, and encompasses everything that both a smokey eye and a flawless cut crease look should be. Thank you for these makeup tutorials!